The unifying theme of Women and Careers is women’s educational and employment success, with the objective of profiling supportive public policy in global contexts from Atlantic Canada to Western Europe, Australia and China. It takes up the career processes of women from marginalized groups who have been underrepresented historically: women who are the first generation to graduate from university in both Atlantic Canada (New Brunswick) and China and rural women from the eastern most Canadian province (Newfoundland and Labrador). It examines the situation of marginalized Protestant women in Belfast, Northern Ireland, who benefit from a European Union program that supports their political and social involvement in an economically underdeveloped region and previously unimagined in a country once wrought by sectarian violence. A policy analysis of an Atlantic Canadian region after the dominant forestry industry leaves takes up policy options and women’s possible agency should economic support return for small business networks and social enterprise, e.g., credit unions, food and social housing cooperatives. Proactive employment equity programs in Finland’s Applied Science Institute and Switzerland’s Forestry Institute provide cutting edge examples of diversity and inclusion policies in education and academia. A comparative study of Canada and Australia of two leading public service employers illustrates incremental outcomes for women managers and professionals but raises the ultimate question of the pace and necessary political will required to remove barriers to gender equality in countries with major gender inequities. 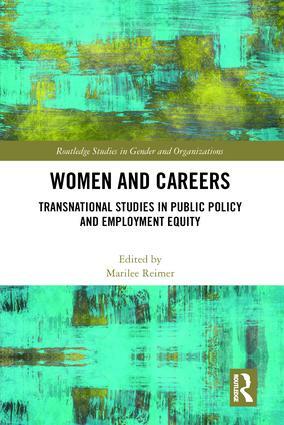 Women and Careers examines a series of institutional contexts transnationally and the impact of policies, programs and economic re-structuring on careers outcomes. It displays the latest research on the topic and will be of interest both to students at an advanced level, academics, reflective practitioners, and diversity managers. It addresses the topics with regard to women’s education and employment and will interest researchers, academics and policymakers in the fields of women’s employment and career studies, diversity programs, organization studies, development policy, gender studies and globalization. Marilee Reimer is a Professor of Sociology at St. Thomas University in Canada. She is the editor of an earlier collection of articles Inside Corporate U: Women in Academia Speak Out, Sumach Press (2004), Toronto, Canada. Although still a fairly young field, the study of gender and organizations is increasingly popular and relevant. There are few areas of academic research that are as vibrant and dynamic as the study of gender and organizations. While much earlier research has focused on documenting the imbalances of women and men in organizations, more recently, research on gender and organizations has departed from counting men and women. Instead research in this area sees gender as a process: something that is done rather than something that people are. This perspective is important and meaningful as it takes researchers away from essentialist notions of gender and opens the possibility of analysing the process of how individuals become women and men. This is called ‘gendering’, ‘practising gender’, ‘doing gender’ or ‘performing gender’ and draws on rich philosophical traditions. Whilst Routledge Studies in Gender and Organizations has a broad remit, it will be thematically and theoretically committed to exploring gender and organizations from a constructivist perspective. Rather than focusing on specific areas of organizations, the series is to be kept deliberately broad to showcase the most innovative research in this field. It is anticipated that the books in this series will make a theoretical contribution to the field of gender and organization based on rigorous empirical explorations.